Our newest product is designed for those with limited space on a balcony or patio, or those with limited mobility. The Veg Table was designed by our shop foreman for a person that gardened from a wheel chair. It is a comfortable 28 inches tall so the person was able to reach to the back and sides while seated. It measures 52″ long by 30″ to the top of the bottom section and another 15″ for the top section. It has manual vents on either end of the lid, has 2 pinch-resistant openers that can be locked in the upright position, and 2 stainless steel hinges. The bottom has drainage holes. The sturdy frame is made from 1 inch PVC pipe that is built to hold a heavy load. We recommend adding a 50 pound bag of pea-stone to the bottom to aid in drainage, topped by new bagged garden soil. 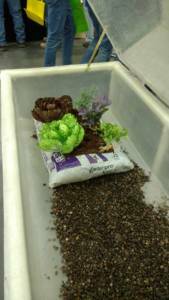 (You can use your own garden soil but along with it may come unwelcomed pests.) Fill to the desired depth and enjoy a fresh, convenient, harvest. The Veg Table is also perfect for those apartment balconies that don’t allow much space for gardening other than an occasional container. Easy to carry to the balcony or patio to set up, all of the contents can be added separately. *Shipping and taxes, if applicable, are additional. Prices in USD. 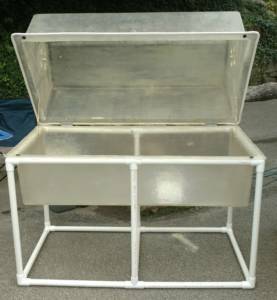 Our cold frame is made using the same fiberglass formula we use for our greenhouses. This formula blocks about 90% of harmful UV sunlight. 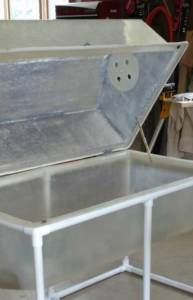 The raised area of the Row Cover measures 24” x 48” with a 2” (approximately) flange around the bottom perimeter. They are 14” tall at the center peak. They are light weight enough to lift if you want to vent them but heavy enough to withstand most winds. The exterior flange can be weighted down with soil or other material if wind is an issue. Updated model has circular, manually adjustable vents on either end. New photo coming soon. 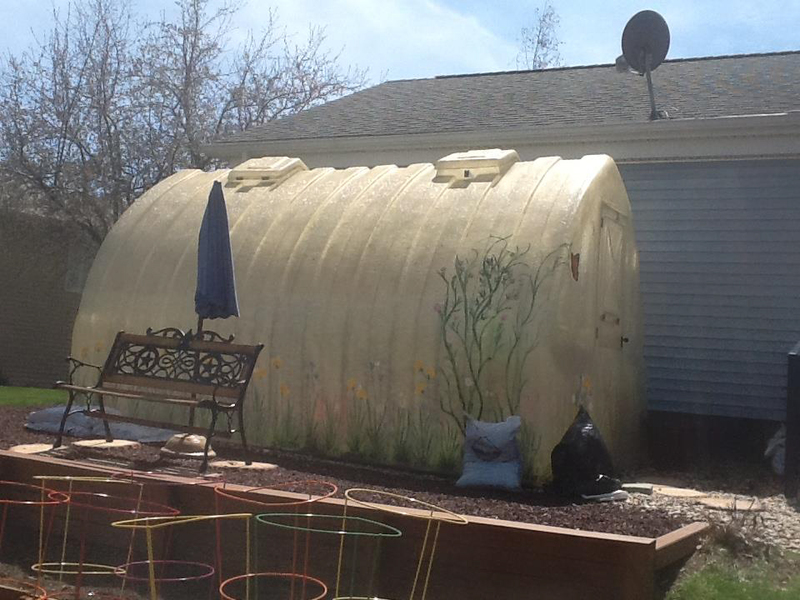 Our plant cover is another quality product made from our fiberglass formulation. Each plant cover measures 22 ¾” at the base and14 ¼” at the top and is 25” high. There is a small center hole at the top for ventilation.There is a 1-inch flange around the bottom exterior edge which can be weighted down or otherwise anchored. 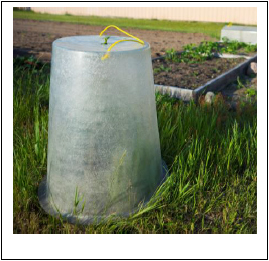 These can see multi season usage – in the spring to protect a favorite tomato or pepper plant from frost; in the summer to protect against insect issues; in the fall to keep late season plants from frost damage; in the winter to protect household perennials from winter ice and wind damage. Updated model has a circular, manually adjustable vent on the top. New photo coming soon. 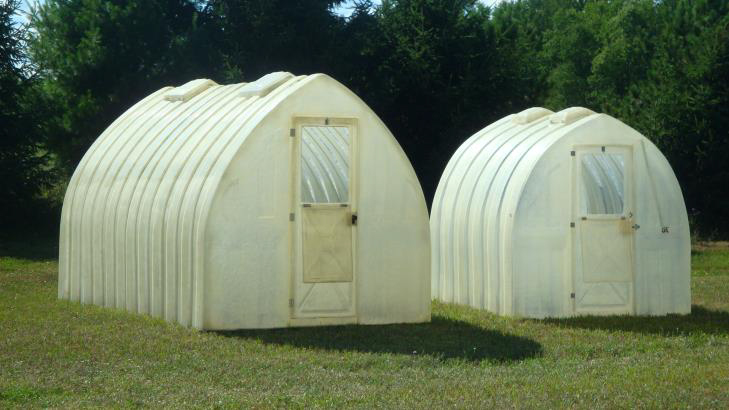 All greenhouses are manufactured by Simply Solar Greenhouses carry a limited 10-year warranty from date of purchase against defects in materials and workmanship. It does not cover damage caused by excessive snow or ice loads. Hardware, such as automatic vent openers, hinges, and hardware are warranted by their respective manufacturers. All warranty claims will be accessed by the manufacturer who reserves the right to decide if the greenhouse can be repaired or should be replaced. Freight charges are not included in replacement options. This warranty is non-transferable, and proof of purchase is required. 1. What Size is it? 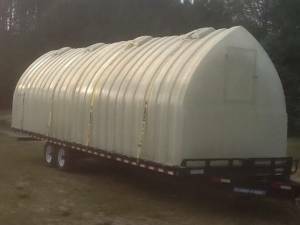 This greenhouse comes in 5 major pieces. When assembled, it is 4 feet wide by 4 feet deep. The front of it measures 5 feet tall and the rear measures 6 feet tall. 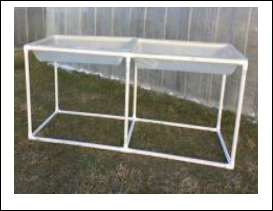 Each potting tray measures about 24 inches wide by 40 inches long, is approximately 7 inches deep, and rests on a 1-inch PVC frame. 2. Is there a vent opener? This model has 1 solar automatic vent opener that has a thermostat that can be set to operate at between 65-85 degrees. When the interior temperature reaches that predetermined point, the cylinder will gradually open the vent hood automatically – no electricity required. When the temperature is reduced, it will slowly close the vent hood. 3. Can it be left out all year in all weather? This model can be left outside all year. It is made from the same high-quality resin from which our larger one-piece models are made. 4. 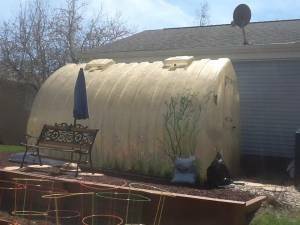 Can it be permanently fixed to a deck or patio? The Patio Model can be mounted directly to a wood deck or cement patio with your own lag screws. We suggest that you use a 2”x2” board on top and along the entire inside edge of the footing flange to support the entire structure instead of having it be supported only by the size of the lag bolt head. The picture below shows this installation option on a large model. The footing flange on the patio model is not as wide as shown in the photograph. 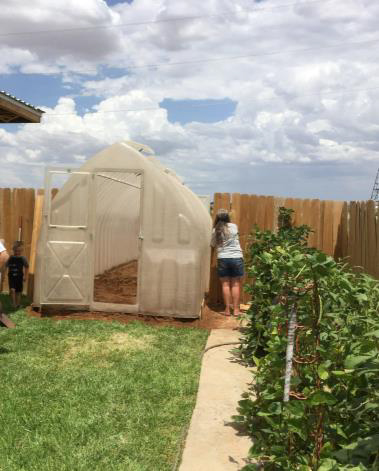 The patio model comes with interior corner brackets that can be weighted down with a cement block, 5-gallon buckets filled with water, or even bags of potting medium. Each of these options also provides a heat-sink affect as well. 5. Can this model be shipped? When we first designed this model, we checked with common delivery services for their shipping specifications. Once we invested in our forms, the shipping specifications were changed, and our size was prohibitive. That’s why we take pre-orders and try to deliver them while we are already on the road. Everything can be shipped for the right price and we had success shipping our larger models via freight. If you are interested in this option, please contact us directly. 6. Can you grow in this model all year long? That’s a tricky question to answer because there are so many variables like where you live, or what you are trying to grow. Please call with specific questions and our staff will try to give you some guidance. Our Hobby Model is our smallest one-piece greenhouse. It is built to the same quality standards as our larger models. 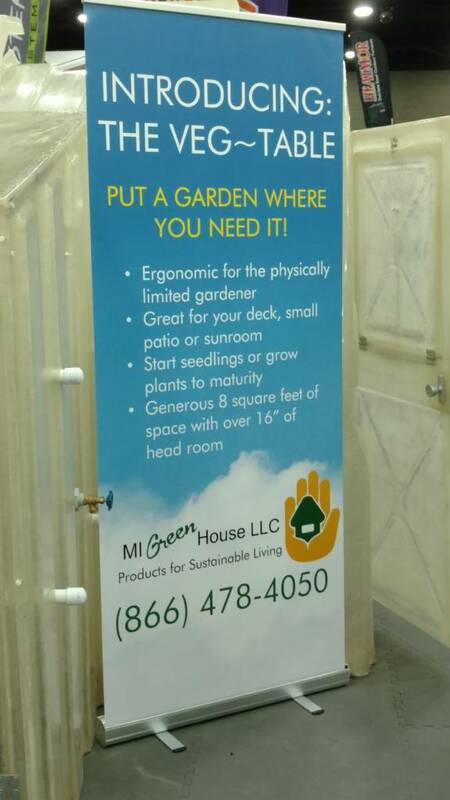 It is perfect for those gardeners who need more space than provided on the kitchen counter or porch to start vegetables or annual flowers in the spring or those who want to protect specialty plants from harmful weather conditions or pests. It measures 7 feet 3 inches tall in the center, 6 feet 8 inches wide at the base, and is 7 feet 9 inches long. These dimensions often fall within the guidelines of Homeowner Associations, but we recommend that you check with your specific governing unit. It has 2 roof vents that open in opposite directions when the preset interior temperature is reached. This off-set design of the vents allows the vent hood to catch a breeze regardless of the direction from which it is blowing. No electricity is required to operate the solar operated cylinders. The cylinders are filled with a synthetic bees-wax type material that expands when it is warmed from the interior heat of the greenhouse. This maximizes air flow. The door (25- 3/4″ by 66″) contains a window (19″ wide by 24″ long) that can be left open for summer ventilation and has a rear window (25″ wide by 31- 1/2 long) that swings to the side as well. The window and vent configuration allow for the best in natural ventilation. 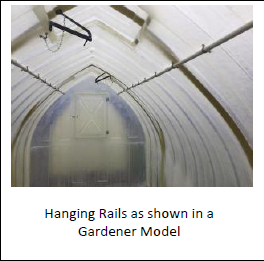 Double or single side Misting Systems or Hanging Rails can be installed before delivery. See our accessories page for more information. Models are kept in stock and can be shipped from either our Missouri or Michigan locations. Our double-sided misting system features PVC pipe with 3 misting heads on each side which emit a fine mist that appears almost like a fog with no visible water droplets. Each side has a cut-off valve, so each side can be operated independent of the other. It is plumbed over the door to connect the two sides.There is an exterior spigot on the right side of the door. A common household hose (with one end reversed) can be easily connected to this spigot and used to irrigate the interior of the house. If you choose to add your own timer, most find that connecting it between the spigot and the hose is optimal placement. Irrigation can be used, not only for watering purposes, but also to help moderate the interior temperature. Because well water is mostly the same temperature, the misters can be used on a cool morning to help heat the greenhouse, or on a hot afternoon to help cool the interior. Hanging Rails help you to make the most out of the interior cubic space available for growing. Because light is reflected and refracted by the fiberglass fragments embedded in the resin, all interior space is potential growing area. 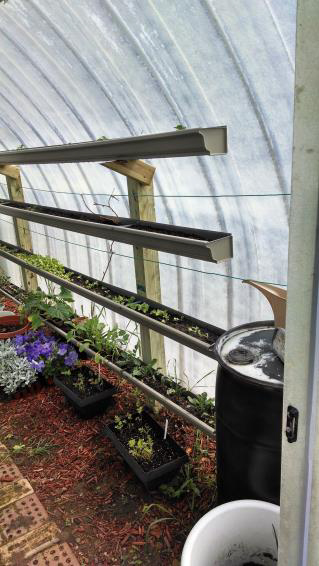 By adding the Hanging Rails, you can utilize the overhead space for hanging baskets and/or for securing support lines for climbing vegetables. This potting bench is from the same high-quality fiber glass used in our greenhouses. The single unit measures approximately 30 inches high x 24 inches wide x 40 inches long. The tray is approximately 7” deep. The stand is made from 1-inch PVC pipe. The bench comes unassembled and requires simple assembly. 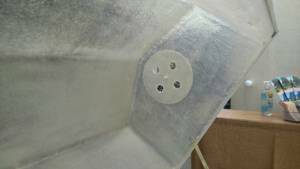 The use of PVC adhesive is optional and unnecessary unless you want to make the joints permanent. It is heavy enough when filled that it really doesn’t need the adhesive. 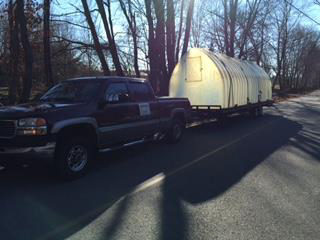 NOTE: They must be assembled inside the greenhouse as they won’t fit through the door when fully assembled. We are happy to show our newest product line. These raised beds were custom engineered for our greenhouses and come in 2 convenient sizes. The ergonomic design is a full 2 feet high which means no bending over to seed, weed or harvest. It is a great solution for growing over poor or rocky soil. Takes only seconds to install, and can be delivered right to your door. Made with 20-year rated heavy landscape fabric and galvanized steel mesh frame. Our kits are designed for the DIY-er who needs the parts to put together his/her own customized mister system for their 7′ x 7′ x8′ Hobby Model. The kit contains 5 plastic clamps, 10 nylon nuts and bolts, and 3 each of the 2-piece misting nozzles and is enough for a single side. You would need to provide your own PVC pipe, caps, elbows and termination supplies. Kit is great for a retro-fit application. Our kits are designed for the DIY-er who needs the parts to put together his/her own Hanging Rail. 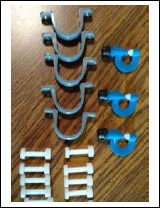 The kit contains 5 plastic clamps and 10 nylon nuts and bolts and will complete one side. You would need to provide your own PVC pipe, and caps. These parts will complete a single side single side Hobby Model. Kit is great for a retro-fit application. 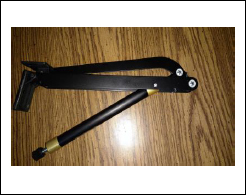 We special order our cylinders and openers from Great Britain. Why re-engineer something that has worked for them for hundred of years? The cylinder is filled with a synthetic beeswax material that expands when it gets warm. 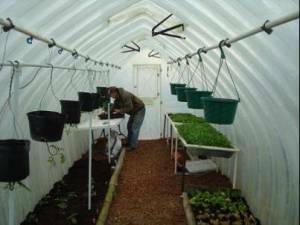 As the interior of the greenhouse warms up, the cylinder expands and gently opens the vent to increase ventilation. When the temperatures cool, the cylinder will contract and gently lower the vent. There is a manual adjustment on the end of the cylinder that allows you to roughly set the temperature at which you want the vent to begin to open.You can purchase the cylinder or opener separately or together. 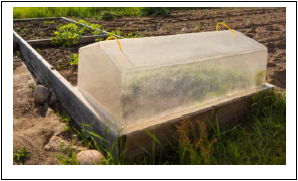 Our cold frame is made using the same fiberglass formula we use for our greenhouses.This formula blocks about 90% of harmful UV sunlight. The raised area of the Row Cover measures 24” x 48” with a 2” (approximately)flange around the bottom perimeter. They are14” tall at the center peak. They are light weight enough to lift if you want to vent them but heavy enough to withstand most winds. The exterior flange can be weighted down with soil or other material if wind is an issue. Now featuring a manual vent for each end. An updated picture is forthcoming. 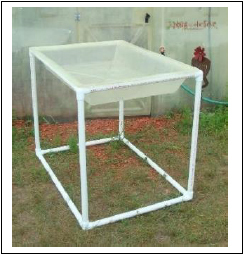 Our plant cover is another quality product made from our fiberglass formulation. Each plant cover measures 22 ¾” at the base and14 ¼” at the top and is 25” high. There is a small center hole at the top for ventilation.There is a 1-inch flange around the bottom exterior edge which can be weighted down or otherwise anchored. 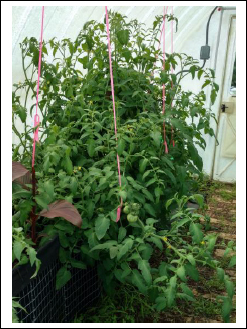 These can see multi season usage – in the spring to protect a favorite tomato or pepper plant from frost; in the summer to protect against insect issues; in the fall to keep late season plants from frost damage; in the winter to protect household perennials from winter ice and wind damage. Now featuring a manual vent on the top. An updated photo is forthcoming. 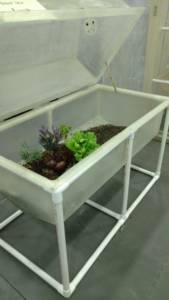 Our Gardener Model is our most popular model and s suitable for those gardeners who need more inside space. It is a perfect space to start vegetable seedlings or annual flowers in the spring. It can be used to protect plants from pests or harmful weather conditions like hail, excessive wind, or too much or too little rain. The spacious size allows room for a potting bench for working at a comfortable height, or garden bench for rest and relaxation. It measures 8 feet 3 inches tall in the center, 8 feet wide at the base and is 14 feet 11 1/2 inches long. The front door is 25″ wide by 74″ high and has a drop-down window that measures 19-3/4″ wide by 28″ long. 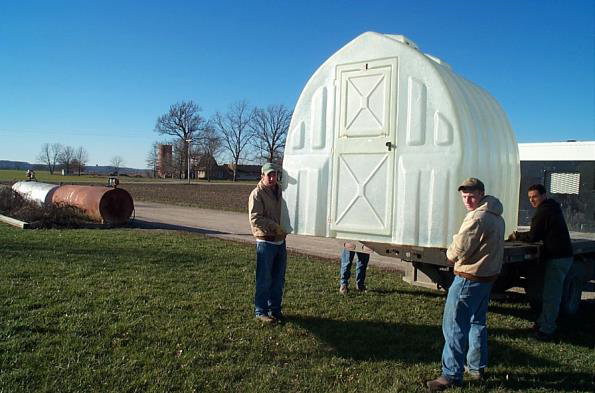 This Gardener Model also has a rear window that swings to the side that measures 25- 1/4″ wide by 35- 3/4” long. It has 2 solar vents that operate when the preset interior temperature is reached. 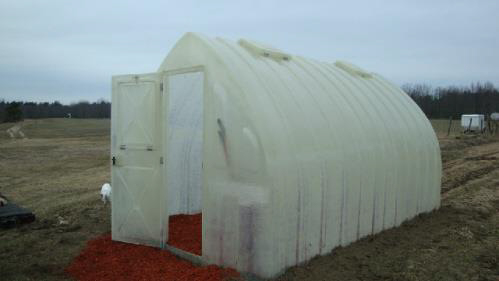 This greenhouse has over 2 ½ times the cubic space of the compact Hobby Model. Take advantage of extra ceiling height by adding an optional hanging rod the entire length of the Greenhouse. Utilize the overhead space for hanging baskets of strawberries, herbs and even tomatoes. Double or single side Misting Systems or Hanging Rails can be installed before delivery. See our accessories page for more information. Models are kept in stock at both the Missouri and Michigan locations and can be delivered or shipped from either location. Customer pick up is also available. Our double-sided misting system features PVC pipe with 7 misting heads on each side that emits a fine mist that appears almost like a fog with no visible water droplets. Each side has a cut-off valve, so each side can be operated independent of the other. It is plumbed over the door to connect the two sides. There is an exterior spigot on the right side of the door. A common household hose (with one end reversed) can be easily connected to this spigot and used to irrigate the interior of the house. If you choose to add your own timer, most find that connecting it between the spigot and the hose is optimal placement. Irrigation can be used, not only for watering purposes, it can be used to help moderate the interior temperature. Because well water is mostly the same temperature, the misters can be used on a cool morning to help heat the greenhouse, or on a hot afternoon to help cool the interior. 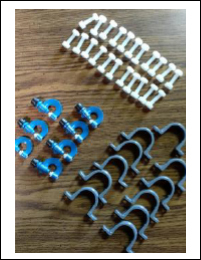 Our kits are designed for the DIY-er who needs the parts to put together his/her own Hanging Rail. 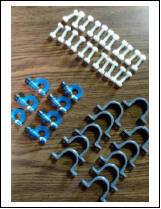 The kit contains 11 plastic clamps and 22 nylon nuts and bolts and will complete one side. You would need to provide your own PVC pipe, and caps. 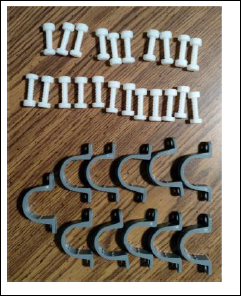 These parts will complete a single side single side Gardener Model. Kit is great for a retro-fit application. This potting bench is from the same high-quality fiberglass as our greenhouse themselves. The single unit measures approximately 30 inches high x 24 inches wide x 40 inches long. The tray is approximately 7” deep. The stand is made from 1-inch PVC pipe. The bench comes unassembled and required simple assembly. The use of PVC adhesive is optional and unnecessary unless you want to make the joints permanent. It is heavy enough when filled that it really doesn’t need the adhesive. We are happy to show our newest product line. 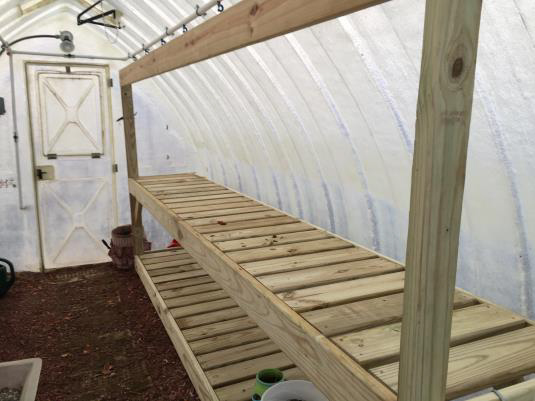 These raised beds were custom engineered for our greenhouses and come in 2 convenient sizes. 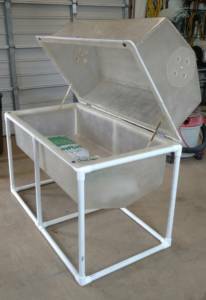 The ergonomic design is a full 2 feet high which means no bending over to seed, weed or harvest. 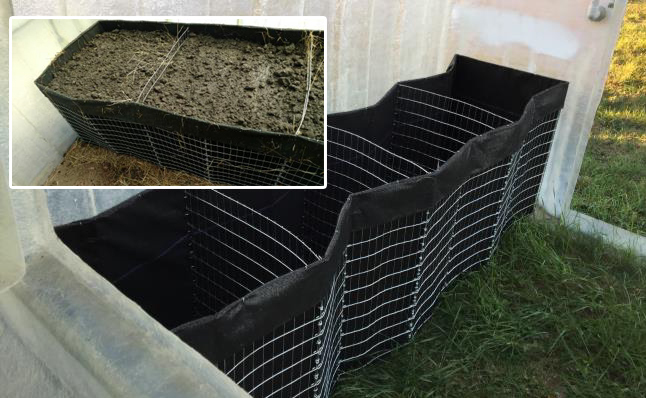 It is a great solution for growing over poor or rocky soil. Takes only seconds to install, and can be delivered right to your door. Made with 20-year rated heavy landscape fabric and galvanized steel-mesh frame. 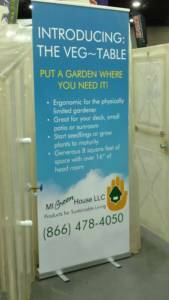 Our kits are designed for the DIY-er who needs the parts to put together his/her own customized mister system for their 8′ x 8′ x 15′ Gardener Model. The kit contains 11 plastic clamps, 22 nylon nuts and bolts, and 11 each of the 2-piece misting nozzles and is enough for a single side. You would need to provide your own PVC pipe, caps, elbows and termination supplies. Kit is great for a retro-fit application. 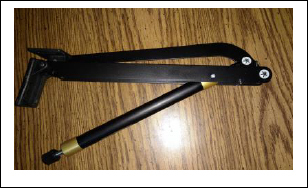 We special order our cylinders and openers from Great Brittan. Why re-engineer something has worked for them for hundred of years? The cylinder is filled with a synthetic beeswax material that expands when it gets warm. 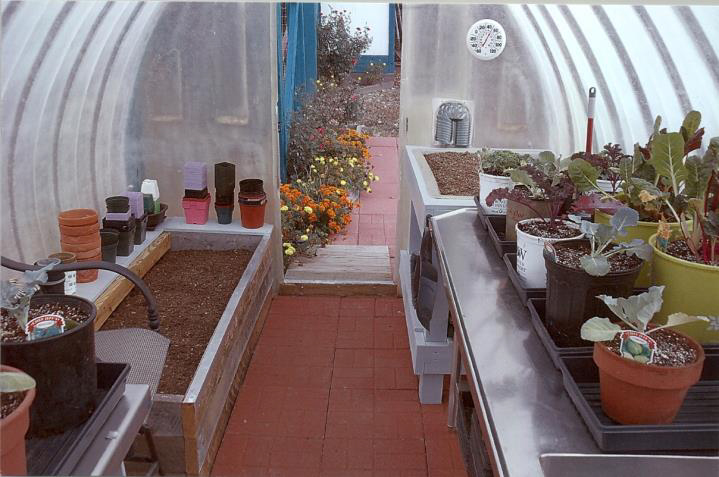 As the interior of the greenhouse warms up, the cylinder expands and gently opens the vent to increase ventilation. When the temperatures cool, the cylinder will contract and gently lower the vent. There is a manual adjustment on the end of the cylinder that allows you to roughly set the temperature at which you want the vent to begin to open. You can purchase the cylinder or opener separately or together. Our cold frame is made using the same fiberglass formula we use for our greenhouses. This formula blocks about 90% of harmful UV sunlight. 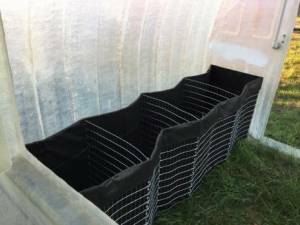 The raised area of the Row Cover measures 24” x 48” with a 2” (approximately) flange around the bottom perimeter. They are 14” tall at the center peak. They are light weight enough to lift if you want to vent them but heavy enough to withstand most winds. The exterior flange can be weighted down with soil or other material if wind is an issue. Now featuring a manual vent on both ends. An updated photo is forthcoming. Our plant cover is another quality product made from our fiberglass formulation. Each plant cover measures 22 3/4” at the base and 14 ¼” at the top and is 25” high. There is a small center hole at the top for ventilation. There is a 1-inch flange around the bottom exterior edge which can be weighted down or otherwise anchored. These can see multi-season usage – in the spring to protect a favorite tomato or pepper plant from frost; in the summer to protect against insect issues; in the fall to keep late season plants from frost damage; in the winter to protect household perennials from winter ice and wind damage. These now feature a manual vent on the top. An updated photo is forthcoming. Our Homesteader Model boasts almost 2000 cubic feet of space and is large enough for those interested in self-sufficiency or those with specialty interests like hydroponics or aquaponics. Our largest model, The Homesteader measures 8 feet 3 inches tall in the center, 8 feet wide at the base and a generous 28 1/2 feet long. The front door is 25″ wide by 74″ long and has a drop-down window that measures 19-3/4″ wide by 28″ long. This Homesteader Model also has a rear window that swings to the side that measures 25- 1/4″ wide by 35- 3/4” long. This model has 4 solar vents that operate when the preset interior temperature is reached. The large interior space has an open floor plan and can be set up by the customer to accommodate plenty of shelves, benches or hanging containers for starting seeds or growing plants. 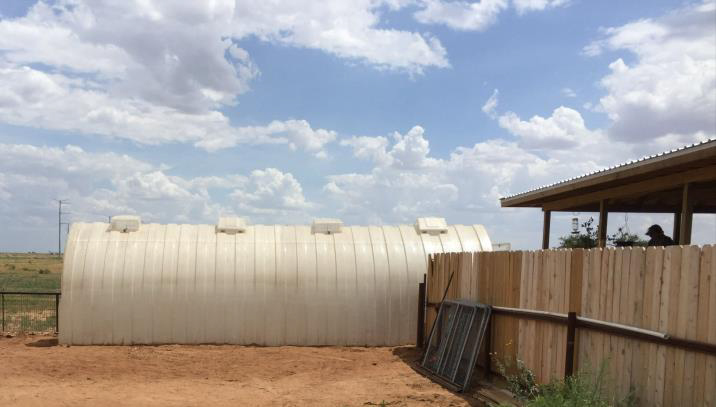 The space is large enough to section off for many uses like a potting and growing area, composting or fertilizing equipment, live animal husbandry, or heat-sink devices. This greenhouse is made to order and can have a door on both ends if desired. 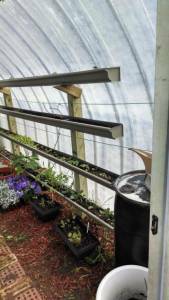 Double or single side Misting Systems and/or Hanging Rails can be installed before delivery. A 25% deposit is required when the order is placed. See our accessories page for more information. This unit is delivered by our trained technicians and comes out of our southern Missouri plant. While the installation process is the same as for our other sizes, it is a little more problematic due to the size and bulkiness of the greenhouse. Our technicians request the assistance of at least two helpers on site when installing this model. 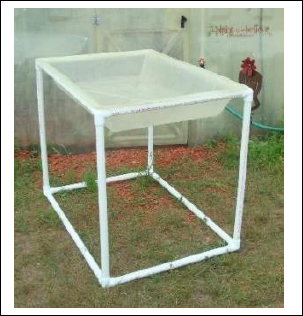 Our kits are designed for the DIY-er who needs the parts to put together his/her own customized mister system for their 8′ x 8′ x 28.5′ Homesteader Model. The kit contains 22 plastic clamps, 44 nylon nuts and bolts, and 22 each of the 2-piece misting nozzles and is enough for a single side. You would need to provide your own PVC pipe, caps, elbows and termination supplies. Kit is great for a retro-fit application. This is our Gardener Size kit Shown. Quantity included is as listed below. Our kits are designed for the DIY-er who needs the parts to put together his/her own Hanging Rail. 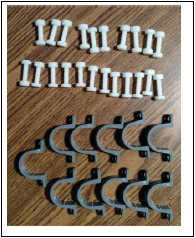 The kit contains 22 plastic clamps and 44 nylon nuts and bolts and will complete one side. You would need to provide your own PVC pipe, and caps. These parts will complete a single side single side Homesteader Model. Kit is great for a retro-fit application. 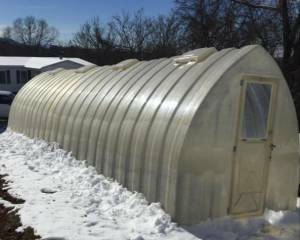 Our cold frame is made using the same fiberglass formula we use for our greenhouses. This formula blocks about 90% of harmful UV sunlight. The raised area of the Row Cover measures 24” x 48” with a 2” (approximately) flange around the bottom perimeter. They are 14” tall at the center peak. They are light weight enough to lift if you want to vent them but heavy enough to withstand most winds. The exterior flange can be weighted down with soil or other material if wind is an issue. Now features a manual vent on each end. An updated photo is forthcoming. 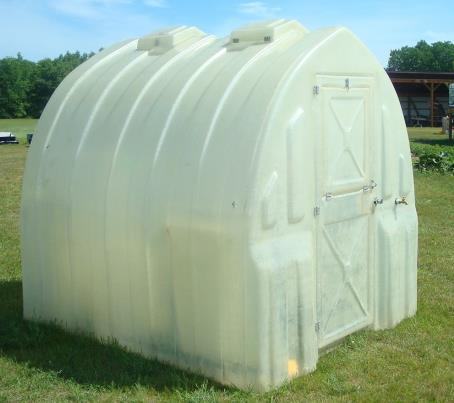 Our plant cover is another quality product made from our fiberglass formulation. Each plant cover measures 22 ¾” at the base and 14 ¼” at the top and is 25” high. There is a small center hole at the top for ventilation. There is a 1-inch flange around the bottom exterior edge which can be weighted down or otherwise anchored. These can see multi-season usage – in the spring to protect a favorite tomato or pepper plant from frost; in the summer to protect against insect issues; in the fall to keep late season plants from frost damage; in the winter to protect household perennials from winter ice and wind damage. Now features a manual vent on the top. An updated photo is forthcoming.